Hello and welcome to the 44th installment of the SWD. Since the last Daily, SAA captured six new localities from IS in Eastern Aleppo, captured localities are: Rasm Khamis al-Sharqi, Jub al-Madi, Zakia, Tall Mahdoon, Al-Sharifeh and Al-Kaysomah. After these advances only the village of Al-Mamourah / Al-Mahdoum separates SAA from reaching Jirah Airbase’s outskirts from the western side. Al-Mamourah / Al-Mahdoum is under SAA fire control and is expected to be captured soon since the hill that supposedly overlooks it “Tall Mahdoon” has been captured. SDF repelled an IS attack near Tabqa Airbase reportedly killing a sizeable number of IS fighters. Now that SDF controls Tabqa Airbase new rumor surfaced claiming that the US will start using it instead of Incirlik Airbase in Turkey. If this rumor happens to be true it would allow CJTF-OIR to provide potentially even greater support to SDF without fear or “bullying” from Turkey which has cut electricity to it on one occasion after the failed coup in July of 2016. There was also an anti-US protest in front of the Airbase calling for its closure. Keep in mind that Incirlik Airbase houses around 50 B61 nuclear bombs which were allegedly transported to Romania but this claim was denied by Romanian Ministry of Foreign Affairs. Again, if this rumor is confirmed it would be the first larger acknowledged deployment of US military personnel in Syria which could boost the already present anti-US sentiment in the region and it would be a golden propaganda opportunity that the extremists were looking for. The new propagated “invasion of Crusaders” could replenish the currently dying jihad in Syria with hundreds if not thousands of new recruits. Even though IS is being defeated and is cut off from all the countries besides those in which it holds territory, Al-Qaeda-linked Hayaat Tahrir al-Sham might take this opportunity to gain even more popularity and potential manpower from locals in rebel-held territory and maybe even from Turkey since Turkish stance has recently changed to anti-US. Ahrar al-Sham and Faylaq al-Sham-led Hama offensive restarted this morning after it was repelled four days ago with minimum gains achieved. Offensive restarted on two axis, north of Kernaz and north of Muhardah, Kernaz one being the main axis. On the Kernaz axis rebels reportedly captured Al-Sakher village and its grain silos, two videos were also released showing destruction of two SAA or NDF tanks in Al-Sakher area. 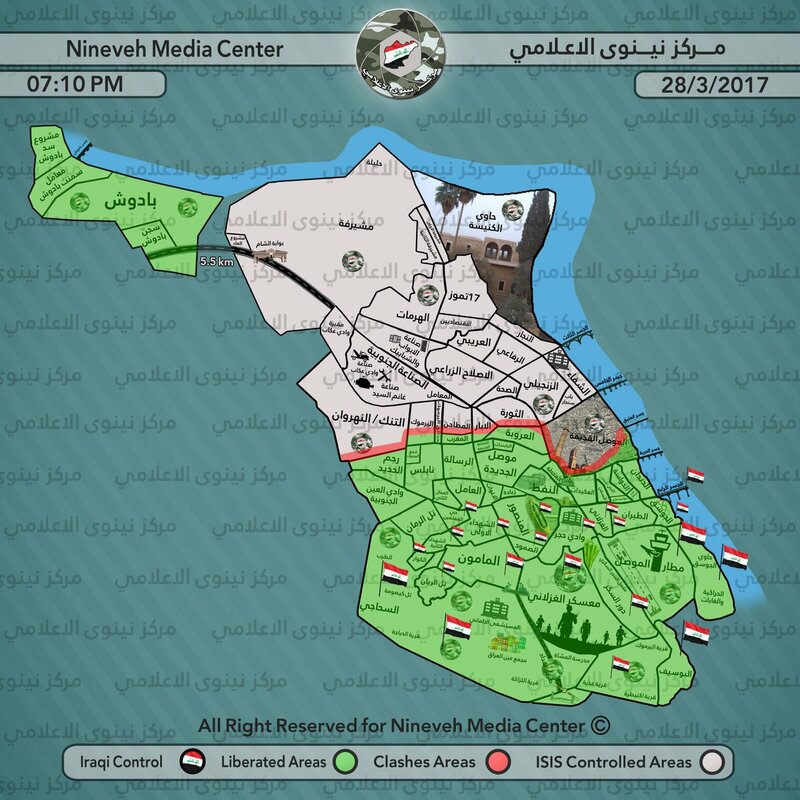 Pro-government sources reported that the offensive was repelled and all gains reversed, as always it is best to keep captures unconfirmed when they are disputed between the two sides until either side shows footage confirming their control over the locality. On the Muhardah axis, rebels claimed to have taken control of Al-Qaramitah checkpoint and Al-Jadeedah village northwest of Muhardah. Pro-government sources again reported that gains on this axis were reversed and offensive repelled, localities mentioned should remain unconfirmed until footage is available. Iraqi Army advanced in “old Mosul” and captured Ras Al-Jada neighborhood inching closer to Al-Nuri mosque. Clashes are also ongoing in Al-Yarmouk district with Iraqi Army capturing around a third of the district from IS. PMU and Iraqi Army shelled IS position in Tal Afar as the offensive on the city is expected to be just days a couple of days away. Iraq Ministry of Oil reported today that the last oil well on fire in Qayyarah was finally put out. Wells were set on fire in July 2016, 8 months ago by withdrawing IS fighters. In August of 2016 IS even tried to burn the city of Qayyarah by flooding it with crude oil. On the 27th of March 2017 CJTF-OIR has conducted 19 strikes in Syria. CJTF-OIR‘s main focus in Syria at the moment is Tabqa-Raqqa region where they did 17 strikes supporting SDF‘s operation against IS destroying two wellheads, a heavy transport equipment piece, three vehicles, a front-end loader, an oil storage tank, an IS headquarters, a vehicle-borne bomb and two fighting positions; and damaged four supply routes. Other areas where two strikes occurred are Abu Kamal and Palmyra suppressing an IS tactical unit and destroying a tank, respectively. Full report on CJTF-OIR strikes conducted in both Syria & Iraq can be found here.